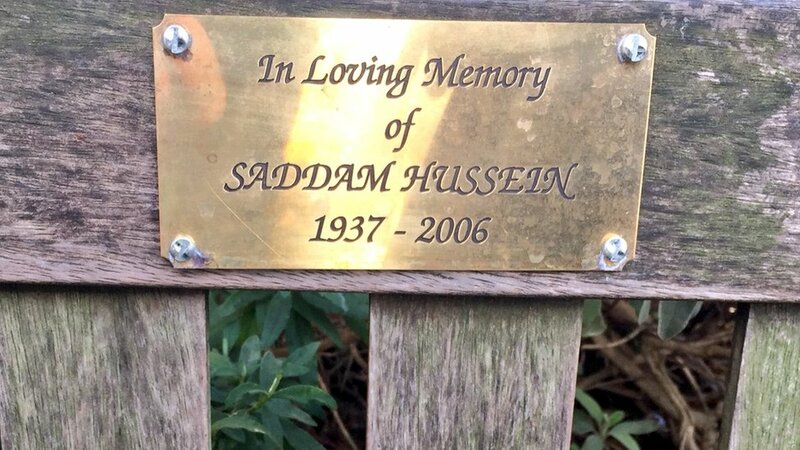 A Saddam Hussein memorial plaque that appeared on an east London bench has been removed. It read: “In Loving Memory of Saddam Hussein” and it is not clear who left it there or what their intention was. Wanstead resident Victoria Richards told the BBC it appeared on the bench on Sunday. Local residents saw it and “expressed their outrage” on a community Facebook page, she said. Former Iraqi president Saddam Hussein, born in April 1937, was hanged in 2006 for crimes against humanity. His rule was characterised by a mixture of brutality, megalomania and paranoia. Victoria posted a picture of the plaque online. Thousands of people have retweeted it and hundreds of people have commented on it. “People have been very angry and upset, especially the Iraqi community. People have been saying it’s a sick joke. “What was there before? Was it someone’s family plaque?” she said. Reaction on social media has been mixed. Some thought it was funny while others were shocked. Some came to the conclusion there must have been another person called Saddam Hussein who was born and died on the same dates as the dictator, and lived locally in Wanstead. I’m surprised by the sheer stupidity of some people on the hub who think there is a chance that there is another Saddam Hussein born and died on the same day who lived locally. The BBC has contacted Redbridge Council for comment.